I had just mentioned qualifying meetings as an important step as you are researching potential major donors. A woman in the audience raised her hand and talked about how impossible it was to get prospects and donors to say yes to lunch. She saw that when she worked in New York, and she was seeing it even more here in LA. Another audience member noted that everyone is busy. Lunch is a big commitment. What she has found much more successful is asking for a 20-minute meeting at their home or office. I see this in my own business. Even if the meeting is at noon, it is in a potential client’s office and not at a restaurant. The focus of the meeting is the business we need to conduct, and then we are done. I kind of like this. Lunch, for me, is a time to unwind; relax. Maybe meet a friend; maybe read. Sometimes just to stare ahead, with not much thought in my head. Beyond my preferences, of course, lies the preference of the prospect. Occasionally there is that person who prefers lunch (or breakfast), but we should not assume that everyone wants meetings to include food. “I would love to get together with you for a quick conversation about your support (or our organization, this new initiative—whatever the purpose of your meeting will be). What time of day works best for you?” is a good way to approach this. I do have a client who received a 7-figure gift and only conversed via text. They never, ever met the donor in person. Unusual, but that was what the donor wanted. Too often, we think we know the best way to cultivate a prospect. And too often, we get frustrated because—clearly—the prospect doesn’t agree with us. 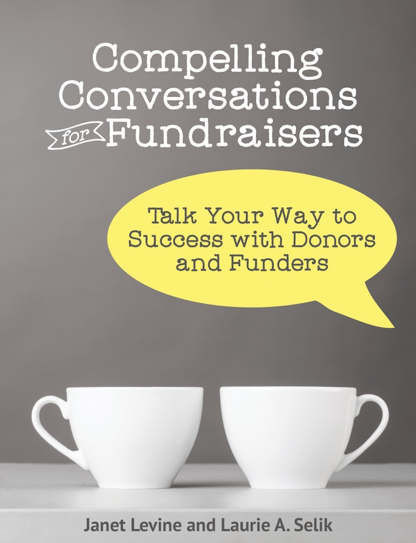 As with all things fundraising related, your best tactic is to put it to the prospect. Because I am on the road a lot, I rely heavily on email. Most of my prospects like that. But some prefer a phone call. In lieu of in person meetings, I offer video conferencing. So people love that we can get together from the comfort of everyone’s own office or home. Other clients hate the idea, and all of our meetings happen in their facility. Your prospects are no different. Finding out what works best in their all too full lives will end up working best for you. And I’m guessing that most of the time, it won’t include lunch. Janet Levine works with nonprofits, helping to move them from mired to inspired. If you need help with your fundraising or board development, shoot me an email or give me a call at 301-990-9151. And do go to my website and sign up for the newsletter. This entry was posted in cultivation and tagged lunch, meetings, qualifying calls. Bookmark the permalink.